Before getting it wet, hop into your kayak on flat ground to adjust the foot pegs and back band to fit you. Then, with kayak in the water parallel to shore, place your paddle shaft behind the cockpit or seat, extending one blade to rest shore-side on firm ground to lend stability when entering. A white-knuckled death grip can lead to discomfort. Relax. Hold the paddle shaft with thumbs and forefingers forming rings, like you’re making the “OK” sign, and keep your other fingers loose. Now you can orient your blades and gain reach without stressing your wrists. To find the right hand position, put the center of the shaft on top of your head, then hold it so that your arms form right angles at the elbow. Many kayak paddle blades are asymmetrical. The spooned powerface is designed for grabbing water with each forward stroke. The other side (backface) is used also for certain strokes. Some blades look lopsided, a feature affording hydrodynamic advantage. Keep the long edge on top. Plant the blade as far forward as you can comfortably reach, rotating your torso without leaning forward. Keep the path of your stroke parallel to the boat. Use a more relaxed shaft angle (45 to 60 degrees) for touring, and bring it more vertical – which places the blade closer to the boat – for a power boost. Information on this page is provided through our partnership with American Canoe Association (ACA) by staff writer Becky Molina. 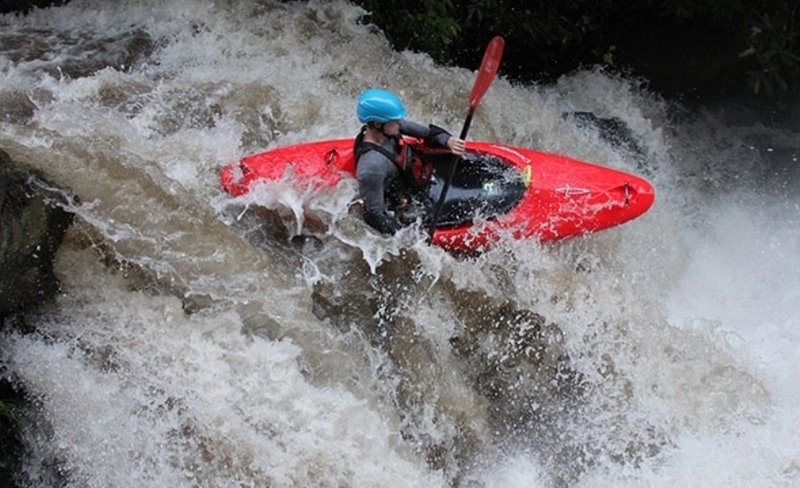 For comprehensive guides on paddling, please visit the ACA website.